Spring-Lok Padlock Seals - Custom. A one-time plate charge of $150 is required for custom imprint. If custom imprint is on file, there is no additional charge. 1,000 per Box, Priced per Box. Please allow approximately 4 weeks for delivery. Spring Lok Plastic Security Seals area self-locking, tamper indicating plastic padlock security seals for airlines and many more uses where a quick removal, fixed length indicative pastic security seals is needed. Tools not required for removal. 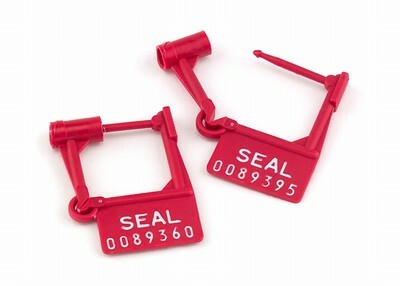 Tamper-evident; hinge will keep seal open if violated; plastic will blush if manipulated. Quick and easy removal by twisting seal.